Podcasts are hot right now and it’s crazy to think they have been around for more than a decade! Interestingly, they haven’t always been as popular as they are today. Back in the beginning, they were only available on computers and it wasn’t until back in 2005, when Apple created the iPod, that many flocked back to podcasting believing they could reach a wider audience. But…where are they headed now? Let’s find out. 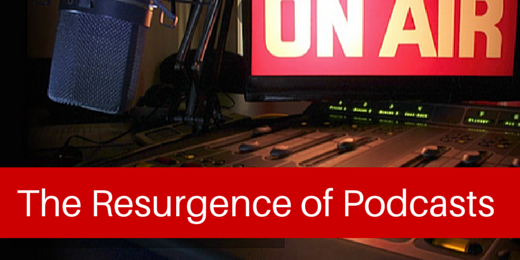 Today, podcasting has made a resurgence and there are signs that it will continue to grow in the near future. One of the clearest signs is the release of Apple’s Carplay which allows anyone to connect their iPhone to their cars. Although only available in selected car models like Ferrari, Honda and Hyundai, it is expected to be released to all newer models with the rest of the big name brands this year. Don’t have the cash to spend on these newer model cars? No worries! You will also have the opportunity to get Carplay thanks to Pioneer Electronics who were one of the premier aftermarket manufacturers to collaborate with their new Firmware For Pioneer NEX In-Dash Receiver available for all model type of cars. One might think, this is all great, but what does all this have to do with podcasting? The answer is everything. The iPhone has given people the capability to download their favorite podcasts and listen to them anywhere. That means that if you are small business owner, freelance writer, or a college student who is trying to showcase your expertise in order to land a dream job, etc., starting a podcast will allow you to reach your target audience and establish your credibility. And Carplay makes it even better because podcasters are now able to reach people who have to commute to work. According to the 2014 industry report by Social Media Examiner, podcasting is the 11th social media platform and is used by 6% of marketers. Doesn’t sound so hot, I know. So then, why should you journey into podcasting? Well, that same report also indicated that 21% of marketers are going to create their own podcasts and that 24% are thinking of the possibility of having a podcast. I believe the percentage of people who want to create their own podcasts will be higher this year (we’ll have to wait for 2015’s report to confirm my guess). Starting a podcast is a challenge but I can assure you the outcomes are all worth it. Choose A Niche: When you choose a niche, you have an opportunity to showcase your knowledge and interview people who are authorities in that niche. Be Yourself: When you show your authenticity in your podcast, everyone will adapt to you in a short amount of time. If you go by the script, then everyone will be turned off quickly. Have a consistent time for your show: If you decide to have the show at one time and then have it at another time, the following week, you will lose your audience and also you will show that you are not very organized. I hope these help! Also, one last thought: I made the mistake for most of my time with the show to have a guest at different times because that was when they were available. Since December, I have had my shows on Monday nights at 7 p.m. central. (The exception was on January 5th when the show was at 3 p.m. central.) to try and build consistency. My hope is that you will avoid mistakes as a podcaster and that you will grow your personal brand and establish yourself as a thought leader, whether you are a business owner, freelance writer, college student or even an employee. To get more of Cheval’s tips on podcasting, join the #BizHeroes Twitter Chat on April 7, 2pm ET, and purchase his book, “8 Lessons Every Podcaster Needs To Learn“.